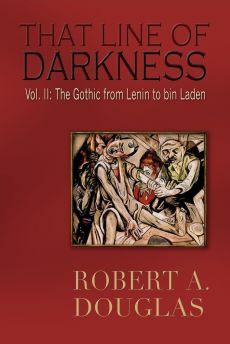 The following selection was intended to be part of the chapter "Fear and Loathing" in That Line of Darkness: The Shadow of Dracula and the Great War (Encompass Editions, 2011) but was excised for reasons of space. 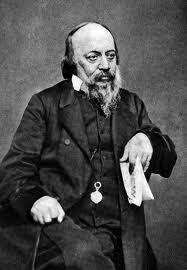 Edwin Chadwick’s 1842 The Report on the Sanitary Condition of the Labouring Population of Great Britain was published in response to a devastating cholera epidemic, a ghastly disease that through convulsive vomiting and diarrhea could consume the body within twelve hours. 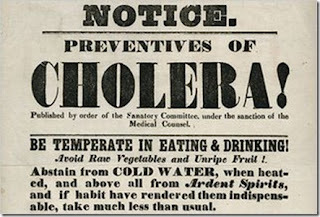 Although by the 1870s it was known that cholera was transmitted from the germs of diseased people and the ingestion of contaminated water, the dominant theory of the time, tenaciously ascribed to by Chadwick and other luminaries such as Florence Nightingale, was that miasma (the effluvium from putrefying matter) was the source of the disease. His anti-contagion hypothesis postulated that the stench redolent of “poisonous exhalations,” emanating from decaying open cesspools, garbage, twelve feet dung heaps, rotting dead rats, and the filth floating in the river could be dissipated with the removal of the animal, vegetable and human filth. Combine the ventilation of homes with the fixing of the drains and disease would ‘almost entirely disappear’ and destitution along with it. Chadwick warned that unless this faith was adopted, England would be confronted with “natives of an unknown country,” a large section of the working population inhabiting this abysmal environment. A magistrate substantiated his words by musing that if empty caskets were placed on the streets, they would soon be occupied “by a race lower than any yet known.” Chadwick particularly singled out the racially alien Irish for their intractable dirtiness and associated them with disease, criminality and political subversion. According to one historian, the cumulative effect of these sentiments was the dehumanization of a section of the population. Since “the condition was so much worse than the reader could presumed to have witnessed—hence the unknown country metaphor—the report had the effect of reducing the natives of that unknown country to the status of foreigners or worse savage’ and animals. [T]he direct introduction into the system of decomposing and putrescent animal matter is capable of producing fevers and inflammations…while the instances in which human beings are seized with severe and fatal affections from the application of a dead animal body to a wounded, punctured, or abraded surface, sometimes when the aperture is so minute as to be invisible without the aid of a lens, are of daily occurrence. 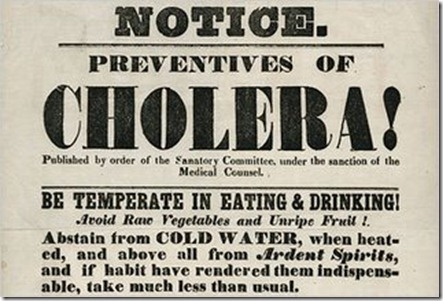 The physician who first demonstrated that tainted water caused cholera was John Snow. 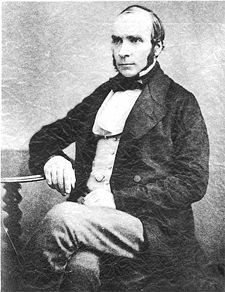 He was an early exponent of anesthetics (administering chloroform to Queen Victoria) and by carefully analyzing the distribution of disease cases helped found the science of epidemiology. 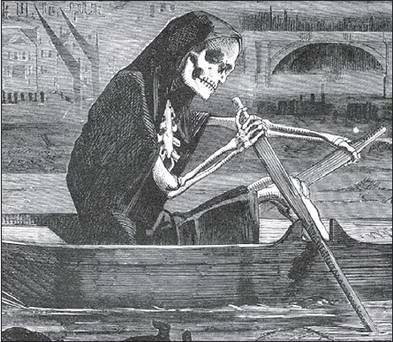 In 1853-4, when a cholera pandemic hit London, one of the two major water supply firms, the Lambeth Company, had moved its Thames intakes upriver, above the tidal (and therefore sewage) reach. Snow showed that most of the cholera deaths occurred among clients of the other major water provider, the Southwark and Vauxhall Company, which still pumped its water in a polluted area of the Thames in the heart of London. In Soho, he noted that local brewery workers (who mainly drank ale) and people in workhouses (which had their own water supply) were unaffected by cholera. Some “morbid remnants” were infecting Broad Street's pump, the disease's sole source in Soho. This breakthrough was all the more remarkable because it was made before Louis Pasteur and John Koch in the mid-1870s had shown that invisible bacteria caused diseases such as cholera and flew in the face of medical dogma, which held that a harmful miasma—"a wandering ferment"—must be triggering the disease. They reinforced Snow’s findings that contagious diseases were transmitted through the water supply. 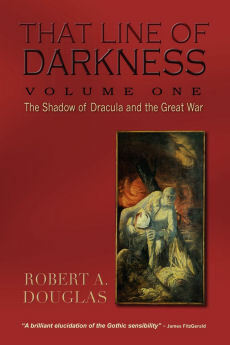 In both Chadwick’s Report and in Dracula, there is a connection between overwhelming stench and fatal diseases. The memories that the young Stoker absorbed from his mother, who experienced first-hand the horror of the 1832 cholera in Sligo such as premature burials, insulated themselves into her son’s literary imagination. That he requested years later his elderly mother to recall them, so that he could record them, sustains the interpretation that he was fascinated by the myth of the living dead and that Dracula could be perceived as the carrier of the plague. By the time that Dracula was published in 1897 defilement, especially of women, when infected by foreign matter was still a common belief. But improvements in urban hygiene as a result of the sanitation changes by the 1860s including the construction of sewers and the growing repudiation of the miasma theory shifted the fear of pollution from physical and medical to a moral and psychological dread.